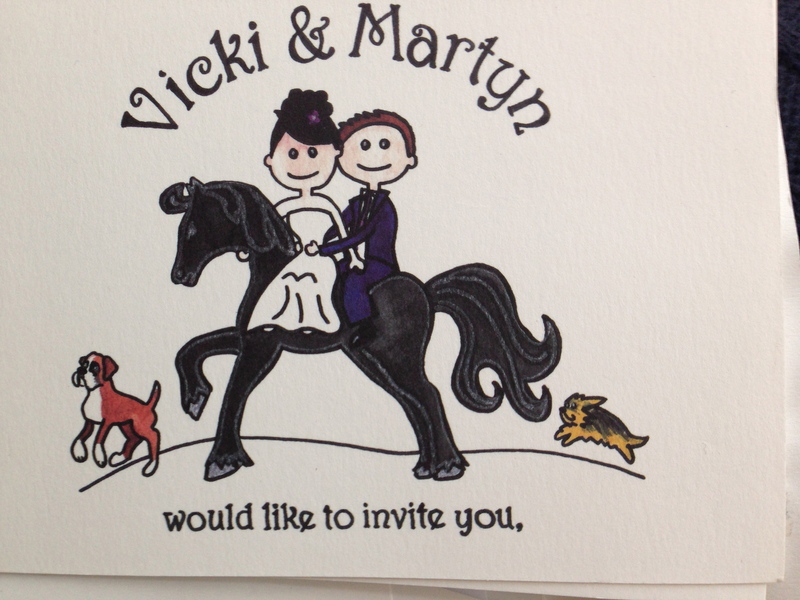 I was blessed today to be invited to the wedding reception of friends, Martyn and Vicki. Weddings always have personal meaning to those attending however today I truly felt this was something very special. Not only could you feel the genuine love for the couple but you also knew that the couple were unrelenting in their giving to the guests and charities they are supporters of. Firstly the colour scheme was a bold purple and white. Why? To honour Vicki’s father and thank the Lymphoma Association. 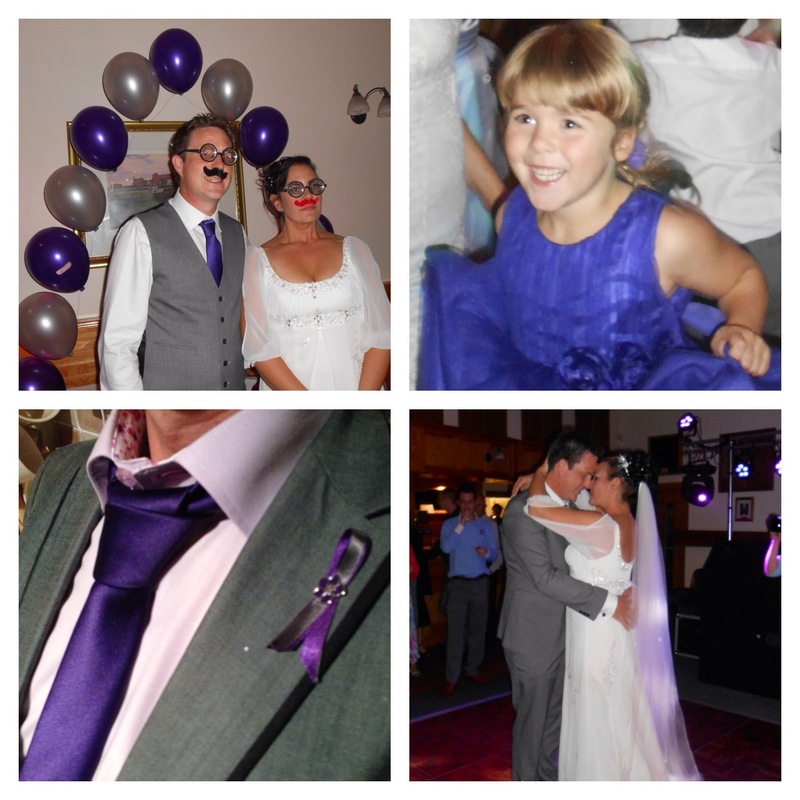 Each guest to the wedding ceremony was given a Lymphoma Association ribbon with a message “Four years ago to this very day a very brave man started his fight against Lymphoma cancer. And he won. Please wear this pin with pride, and in the knowledge that it means that we have helped someone else fight the fight. So they can win too. Just like Vicki’s dad Bryan.” Not a dry eye when Bryan was there to give Vicki away on her special day. At the reception venue there were also collection tins for the Lymphoma Association. What a beautiful tribute to Vicki’s father and the charity that supported him and his family through some difficult times. At the evening reception I had to chuckle when I arrived to find that some guests were already sporting tashes! The bride had said to me last year that she’d love tashes at her wedding… my bag was packed! 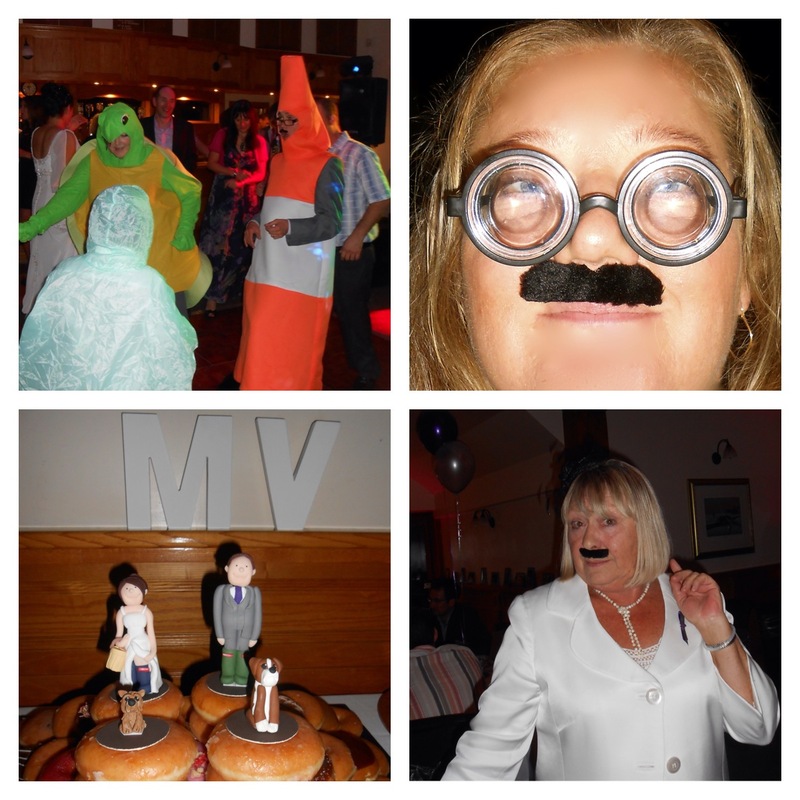 The bride and groom had dressed each table with a selection of romantic, thoughtful items together with some fun sparklers, glasses, tashes etc. The evening was wonderful. 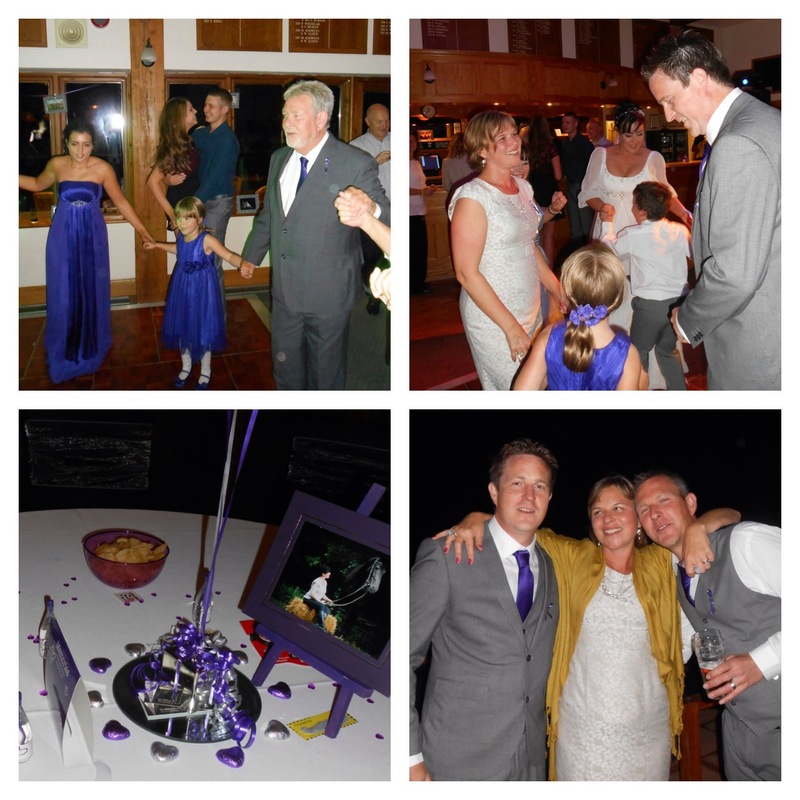 The music choices fabulous… it’s rare I go to a wedding where there are more guests on the dancefloor than off it! We were even joined by a traffic cone and a turtle. In addition, Vicki and Martyn were clear that they didn’t want wedding gifts but would prefer donations be made to the Lymphoma Association or other charities they support, Ellenor Lions Hospices and Bradbourne Riding for Disabled. How incredibly generous for a bride and groom to share their precious day with family and friends but also others who will benefit from the donations and awareness. What a great idea and one that could be incorporated into so many events. I was truly touched by the thought behind all the choices and the incredible detail that had been put into making the wedding day and reception so special for the happy couple but also each and every guest. 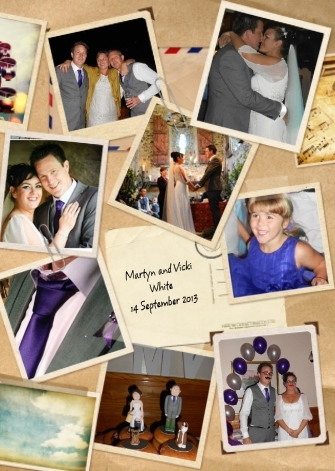 Wishing Vicki and Martyn a lifetime of love and happiness together.